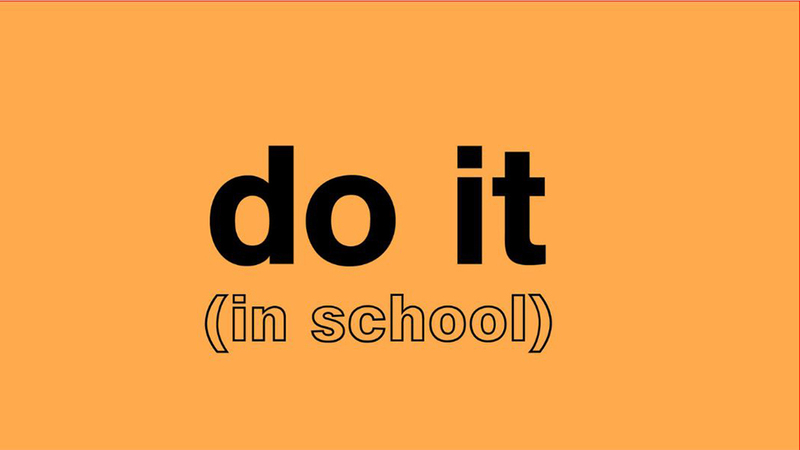 Building on this history, the latest version of the exhibition is called do it (in school) and is a selection of instructions that form a study-based curriculum for high school students. Over the past six months Studio in a School NYC artist-instructors adopted do it (in school) into their curriculum at three New York City high schools: Art and Design High School, Manhattan; Fordham High School for the Arts, Bronx; Frank Sinatra School of the Arts High School, Queens. Featuring instructions by: Etel Adnan, Uri Aran, Yto Barrada, Robert Barry, Jérôme Bel, Bernadette Corporation, Christian Boltanski, Louise Bourgeois, Cao Fei, Claire Fontaine, Jimmie Durham, Simryn Gill, Dominque Gonzalez-Foerster, William Forsythe, Joseph Grigely, Shilpa Gupta, Anna Halprin, NS Harsha, Madeline Hollander, Jonathan Horowitz, Pierre Huyghe, Joan Jonas, Allan Kaprow, Alison Knowles, Aaron Koblin, Koo Jeong-A, Bertrand Lavier, Lynn Hershman Leeson, Sol LeWitt, Lucy R. Lippard, David Lynch, Jonas Mekas, Annette Messager, Eileen Myles, Jean-Luc Nancy, Bruce Nauman, Ernesto Neto, Rivane Neuenschwander, Albert Oehlen, Precious Okoyomon, Yoko Ono, Füsun Onur, Clifford Owens, Thao Nguyen Phan, Cesare Pietroiusti, Adrian Piper, Raqs Media Collective, Lillian F. Schwartz, Hassan Sharif, Jim Shaw, Shimabuku, Rikrit Tiravanija, Carrie Mae Weems, Erwin Wurm, and more.